I'm usually pretty good at remembering important dates of interest to the hobby. So it's with some sheepishness that I admit to having forgotten what would have been the 117th birthday of J.R.R. Tolkien on January 3. I suppose some will no doubt see this as further evidence of my "war" against acknowledging the professor's influence over the creation of Dungeons & Dragons. Like my reservations about the thief or my low opinion of Dragonlance, my willingness to take Gary Gygax at his word when he repeatedly stated that Tolkien was but a minor influence on the game he co-created has become the stuff of humor in certain quarters. The really funny thing is that my opinion on the matter is not born out of dislike of Tolkien or Middle-earth, but rather the opposite. It's precisely because, in my later years, I've become such an admirer of Tolkien's work that I find it hard to credit much commonality between his writings and D&D -- or indeed any fantasy roleplaying game, including those that were in fact set in Middle-earth. When I was a child, I of course read The Hobbit and, later, The Lord of the Rings. I liked both well enough, but, beyond taking certain visual cues from them, I can't honestly say that they had much impact on my playing of D&D. Indeed, I found much of The Lord of the Rings deadly dull. There was too much poetry and song and a lot of it read more like a travelogue than an epic fantasy. I know for a fact that I used to despise the "The Scouring of the Shire," part 8 of Book VI of The Return of the King, seeing it as anticlimactic in the extreme, whereas now I am convinced that it is in fact the true climax of the entire novel. If one is so inclined, feel free take this all as yet further evidence of my dislike of Tolkien and use it to explain away my blindness as to his "obvious" influence on Gygax. One of the reasons I have grown to admire Tolkien as I grow older is that I see more clearly now that, despite caricatures to the contrary, The Lord of the Rings is not in fact about the triumph of good over evil. That may be the theme of Tolkien's impersonators, from Terry Brooks on down to Peter Jackson, but Tolkien himself would have laughed at the notion that the history of this world was anything more than a "long defeat," as he so eloquently described it through the voice of Galadriel in The Fellowship of the Ring. For Tolkien, we may in this life experience glimpses of what the final victory over evil might be like, but they are fleeting and even the greatest of our victories always brings with it terrible loss. As others have noted, The Lord of the Rings is not an epic but an elegy and creeping senescence makes me appreciate elegy ever more. I find it hard to imagine how one could argue that D&D, whether in its Golden or Silver Age forms (or later), is an elegaic game. It's always been a vehicle for escapism and while Tolkien acknowledged the salutary effects of escapism, The Lord of the Rings is not a work of escapism. To read it that way, to treat it that way, is to misunderstand it on just about every level. More to the point, as an example of escapism, it's woefully boring. That's what I thought as a kid and that's how Gygax described it on more than one occasion. That's why D&D is full of orcs and balrogs and halflings and treants: they're the things a shallow reading of the novel remembers about it. They're cool and shiny and easily given stats for use in your next dungeon crawl. But meditations on the inevitability of loss in a fallen world aren't quite so compelling for gaming, which is why no edition of the game has ever encouraged or supported that kind of play. And I don't think that's a bad thing. Much as I admire and agree with Tolkien, I'm not sure I'd enjoy playing a game about the themes of his own works. I have real life if I want to experience the long defeat. When I game, I want an escape from that, if only for a little while, and D&D, based as it is on escapist pulp fantasy, has done a fine job of providing that. 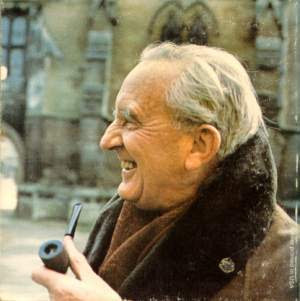 For myself, the two are not contradictory but complementary, which is why I raise a belated toast to Professor Tolkien on the memorial of his birth. He wrote a tale that has immeasurably enriched me and will no doubt continue to do so as I read it again and again. I can't say that of very many authors, which is why, despite my heretical beliefs regarding his influence over my hobby, I hold him in the highest regard. I did find myself taking a lot of influence at one point in my DMing career, not from Tolkien directly, but from the Atlas of Middle Earth. Those maps were fantastic. I took a similar inspiration from SPI's "War of the Ring" wargame, which was a hex-and-counter wargame simulating the events in LoTR, with the emphasis on the war between Mordor and Gondor. Many of my homebrew maps from that era bore a distinctive Middle-Earth-esque stamp; lots of fallen kingdoms, realms whose borders were defined by mountain ranges, etc. Your essays never fail to fascinate me, as much for the language as for the content. Happy birthday JRRT. I've always found myself attracted more to The Hobbit than to LotR. I used to want to see the maps as Bilbo and Company saw them. I wanted to experience the fight with the spiders "Attercop!" and ride the barrels. The conversation with Smaug has influenced how I see dragons forever. To me, in my beginners's study of pulp, The Hobbit 'feels' more like the good/evil story than any of the others. The Simarillion was, to me, a study of lore and legend in textbook fashion and LotR felt like a long 'goodbye' than anything else. However, I will say that LotR's maps will forever influence how I want to see maps in my gaming products. James, that is a stunningly beautiful piece of writing. Both heartfelt and possibly the most illuminating discussion of the connection between Tolkein and D&D that I've seen to date. I concur w/ your analysis of LotR as being more about the inevitability of loss rather than a rousing adventure story, although I've seen the argument made before (most recently, in Tom Shippey's Author of the Century.) However, I'm too lazy a Tolkein enthusiast to translate the title of your post. A little help, please? The older I get, and the more I read, of D&D and other, the more I see less and less influence of LotR's on D&D and otehr influences. L Beau, it's Sindarin for "happy birthday". I think you're right. Detailed as it is, lotr's effect on a campaign should be inspiring, as are say the works of Vance, E.R Eddison, Lord Dunsany (the 1pg Death and the Orange or Charon) or W.H. Hodgson (Nightlands). Tolkien did not have an exclusive hold over my imagination when it came to fantasy. I always felt as a DM like a magpie hopping from source to source, stealing ideas and refracting one author's idea in the style of another. What kind of conversation would take place between Sam Gamgee and Cugel the Clever? Would Don Quixote have puzzled one of the Black Riders? It is too tempting to break from a Middle Earth style 'reality' and inject some insanity or instill some horror. I differed from you in favouring a sort of violently lurching deep background story but wholly agree that whimsy, awe, anachronisms, lethal danger to PCs and respect for randomness are vital to an enjoyable game. I do not know, and am not sure, that D&D does translate badly to an epic elegy (and I would argue that most epics are a form of elegy). Even REH's Conan tales occur against a background of defeat and decline, against which Conan's life is a bright and fleeting moment. That would also be my feeling with regard to the average D&D campaign. The adventures and successes of the player characters are all the more notable because they are exceptional, contrasting with the hardships of the world, both past and future. No, as much as I love Tolkien's work and agree that its impact on D&D is much less than is commonly proposed, I do not think that it is its elegic form that separates it from traditional adventure games. Perhaps from D20/3e, but not from my experience of B/AD&D. Tolkien's work is a significant influence on the class/race structure of D&D, but on the whole I think Gygax was right. Flavor-wise, he is a minor contributor to the patchwork pulp environment of the game itself. Your essays never fail to fascinate me, as much for the language as for the content. I really appreciate your saying so. Not to sound like a broken record, but it does my heart good to know people are enjoying what I've written. Knowing they enjoy how it's written is terrific too. You're very kind to say so. Thanks. I do not think that it is its elegic form that separates it from traditional adventure games. You might be right. I've personally never had occasion to play in a campaign that seemed very much like Tolkien in spirit or that even conveyed the tragic aspects of victory very well. That might just be a failing on my part, but I'm not sure. Certainly TSR did nothing to promote such an approach to play. None of the campaign settings it published were really in this vein that I recall, but maybe I'm overlooking something obvious. When I game, I want an escape from that, if only for a little while, and D&D, based as it is on escapist pulp fantasy, has done a fine job of providing that. But couldn't one say the same thing about "when I read?" the only rpg I've played with any seriousness is d&d, so my perspective is narrow, but the debate over its influences seems to overlook the singularity of rpgs as a form. so we could talk about the influences on particular modules (none of which, to my mind, show any influence of Tolkien) but I'd to think to think the game itself is "neutral" in the same as poetry or sculpture or any other vehicle of artistic expression. and yes, as others have said, your words on Tolkien do enhance my understanding of his work. my willingness to take Gary Gygax at his word when he repeatedly stated that Tolkien was but a minor influence on the game he co-created has become the stuff of humor in certain quarters. I hope I didn't offend in my post on artifact destruction. I was just kidding around, honest! Not at all, Jeff. I was actually thinking of some things posted elsewhere that clearly weren't just kidding around. No worries. The more I read Tolkien, the more I'm inclined to agree with you that The Lord of the Rings is decidedly NOT an influence on D&D except in a few cosmetic touches, but I maintain that the Hobbit's influence is much clearer and harder to deny, if not in Gygax's original intent, then in actual practice. Yep, I think this is an important point. IMHO it was used as a model for how to employ the concept of an adventuring party going on adventures. First off hi, I've been reading your blog for a while and think its great. This was a very insightful piece. I too garnered a much deeper appreciation of the professor with age. Middle Earth is not a "fantasy world", it is a "mythological world" where universal themes play out, and these themes become more apparent with a little age and insight, I think. D&D is and always has been fantasy that adopts elements of myth but seldom more than superficially and even though it uses "the hero's journey" as a starting point it usually lacks a meaningful outcome... but killin' monsters and stealin' their things is still cool. Tolkien influenced my RPG gaming in the areas of world building and DM narration. My players could always tell when I had been reading LORD OF THE RINGS when my "flavor text" and NPC dialog became rather eloquent. I'd say the main distinction between Tolkein/LOTR and pulp fantasy is the nature of conflict. In pulp fantasy, the conflicts are physical and mental. The hero's challenge is to outwit and outfight his adversaries. In LOTR, the key conflicts are moral in nature - that is, the heroes ultimately fail or triumph based on their moral choices. Why does Bilbo survive long exposure to the Ring? Because he's the sort of fellow who takes pity on Gollum. Many of the great powers in LOTR have to choose between giving up the world and losing their souls. Gandalf and Galadriel both are tempted to take up the Ring and rule Middle Earth, but choose instead to see their age end and fade into oblivion. Sauruman turns to evil because he can't resist the temptation of power. It's not a matter of optimism vs pessimism - stories of moral conflict can be optimistic (Narnia, Star Trek), pessimistic (LOTR of course) or in between (Casablanca, The Man Who Shot Liberty Valance.) It's more a question of what determines the hero's triumph or failure. D&D works better for straight up action stories than it does for morality plays. In D&D terms, DeCamp & Pratt > Tolkien. The most elegiac RPG experience I've had was the final phase of a Pendragon campaign. The cannons of his adversary were thundering in the tattered morning when the Majesty of England drew himself up to meet the future with a peaceful heart. Decipher's LOTR RPG has a GMing chapter which brings out the themes and tropes of the novels and suggests how to use them in an RPG. I'm not sure it was very successful though. The Hobbit is much more of an adventure story and much more easily used as a model for FRPGs. That was indeed a very beautiful article, and a great analysis to boot. My gateway into RPGs was Warhammer Fantasy Roleplaying, which has (or used to have) a very fatalistic world in decline vibe to it. I saw Dragonlance as a more "upbeat" take on things, but I think an interesting argument could be made for a form of elegy present there (in the sense of the tendency towards "balance"). Certainly, TSR never really did much to promote a sense of the "long defeat", but many of the campaign worlds could be viewed in that light to varying degrees. I would guess that part of it is that the twilight years of an adventurer's life are rarely dwelt upon. It might be interesting to consider some non TSR campaign settings, such as Troll Lord Games' Aihrde and the After Winter's Dark or Fantasy Flight Games' Midnight campaign settings, and their view of the future. It is, after all, in the interests of fantasy adventure games for evil to be perpetual, if not entirely undefeatable. I think the issue you raise here is extremely interesting, but I think elegy is not binary; perhaps the degree to which it is present can be a significant guidepost, though. It definitely bears thinking about. IMHO it was used as a model for how to employ the concept of an adventuring party going on adventures. It's possible. I'm at least open to the idea, although, as others have pointed out, there are in fact examples in non- (or even pre-) Tolkien fantasy literature (Merritt, for example) that could have been used as a model for the adventuring party. D&D works better for straight up action stories than it does for morality plays. I think that's the right. Now, I think it's certainly possible to do morality plays in D&D and I have, but I'm not sure the implied style of play is conducive to it. No arguments from me, but then that's hardly a surprise. I feel like an idiot for not having remembered Pendragon -- all the moreso because it's one of my favorite RPGs. You're absolutely correct on this score and, from my experience, most people who play the game for any length of time very quickly find that it's one of the finest vehicles ever written for just such a thing. It's an amazing piece of work. My gateway into RPGs was Warhammer Fantasy Roleplaying, which has (or used to have) a very fatalistic world in decline vibe to it. Tolkien, of course, isn't fatalistic at all, though I agree that fatalism is quite gameable (though not really my cup of tea). I think the issue you raise here is extremely interesting, but I think elegy is not binary; perhaps the degree to which it is present can be a significant guidepost, though. Quite possibly, though the main point of the original post was simply that the only thing OD&D took from Tolkien was some very shallow surface features, which is perfectly consonant with Gygax's claims in later years. Thematically, OD&D doesn't share much with Middle-earth and a fair reading of both texts would make this quite plain. I don't know about that. Tolkien's Middle Earth strikes me as very fatalistic place, but understanding the role of fatalism in the context of Christian free will is a tricky business and perhaps the whole thing is better left for another forum. I certainly would not argue with that, I just would not place the emphasis on elegy or lack thereof (I do not think OD&D is concerned with conveying such things). but understanding the role of fatalism in the context of Christian free will is a tricky business and perhaps the whole thing is better left for another forum. It depends on what you mean by "fatalism." I take it to mean a denial of free will entirely, by which understanding Middle-earth simply can't be fatalistic. I take it that you employ a "softer" definition of fatalism than that. I think the crux of the issue for me is whether or not playing an elegaic version of D&D is playing against the grain of the game, as conceived by Gygax and Arneson. I think it's pretty clear that it is. That's not to argue that a putative elegaic D&D is "wrong," only that it's not in keeping with its origins. Certainly, in the context of Middle Earth, fatalism and free will need to be understood from a Boethian point of view, which allows them to coexist in a pseudo Christian framework. I would disagree with this (as you have probably surmised); I think things are much more nuanced than you are allowing for here, but as with the above, it may be more about definitions than anything else. Certainly, the game does not encourage the participants to dwell on death, defeat, or perpetual decline, but I do not think that precludes or discourages an elegaic larger context. Indeed, I think it heightens the experience in many ways, and obviates the need for things like Dragonlance: The Fourth Age. D&D is designed with an emphasis on an ever rising career, at least for human characters. If a particular character is important enough, then his permanent passing might be a significant loss and sorrow -- but that is in my experience rare. Worlds in decline tend to be regarded as opportunities for adventure more than for reflection on what has been and is no more. Even the passing away of magic is likely just to add a sense of "freshness" to a campaign. Sure, but that is specific versus contextual. It is not like the career of Aragorn is one of permanent decline and sorrow, it is a bright spot against a dark night, and one which leads to heirs. It is micro trends set against the background of macro trends. D&D just doesn't deal with the macro trends, looking only towards the micro, the "here and now". There is often some sort of "golden age" preceding the deeds of the adventurers, but I am not sure even that is present in OD&D. Hi James, great post. I started writing a response but it got too lengthy, so I went ahead and moved it over to my blog. You can find it here, if you're interested. Outside of the obvious monster and races I used, I think the two things I lifted the most from LOTR and The Hobbit for my game world was the existance of museums and postal services. One thing I know for sure is this: the Middle Earth RPG was one of the most boring games I ever participated in as a player. In several hours of game time, not one damn fight. Just movin' through the woods. In LOTR and the Hobbit, there were a lot of superfluous encounters with monsters, such as barrow wights and Old Man Willow, that would count as wandering monsters in the wilderness in a game, or even room monsters if it were tranlated into a dungeon crawl instead of an overland adventure. I think D&D boiled down a lot of the essence from a lot of sources, leaving out all that boring "on the road to Rivendell" nonesense. Did any writer of pop fantasy describe a world so full of monsters (especially ones that didn't make a lot of sense) as a classic D&D game world? I'd say James may be right in taking Gygax at his word that LOTR didn't have huge influence over D&D's creation (though it had some). But by the same token I think it DID have a strong influence on D&D later on, and on the play of most D&D players. Also I think there is room for all themes in D&D. Players don't need to win all the time so long as the story told is a good one. This is a really wonderful discussion: James, thank you! I have played in campaigns like this, but only homebrew (oddly, often SF). CoC is supposed to work this way, but I've never been in a campaign that actually followed that grain. It strikes me that the most peculiar (and, for me, alienating) thing about Vampire is that it veered off this course immediately after publication of the first rulebook, which features a clear sinking status order and finite and tragic concept of "immortality." Bushido seems inevitably elegiac, not to say tragic (like Pendragon), but I haven't seen the rules in 20 years, so I can't be sure. I suspect elegy is an extremely minority interest in the gaming market, and that's why it's rare in the bigger published works. The thing I'd really like to know is, what is the role of landscape in LOTR? By page count alone, I think it's the biggest theme in the novel; it clearly meant a lot to JRRT. Sometimes the work it's doing is obvious (Emyn Muil, Mordor), but often I think there's something quite else going on, that I don't have a key into. "take away every Tolkien inspired or stolen idea from D&D and see what is left..."
It's much easier to cull Tolkien from D&D than to, say, run a purist Tolkien game using the D&D rules. Tolkien is the flour that helped make the bread that furnished the basis for the PB+J that is D&D as we know it. Worlds in decline tend to be regarded as opportunities for adventure more than for reflection on what has been and is no more. That's my sense of it as well. It's why I think that there's a very strong difference between the decline of the Hyborian Age and that of the Third Age. There is certainly a different spin on the nature of reality between REH and JRRT (as one might expect), but that is not really what is at issue here. The question is whether OD&D (or even AD&D) discourages or is incompatable with elegy, or else promotes a form of counter elegy. Given that no provision is given towards the future in terms of macro trends (that I can detect) the answer is a categoric no. That general (not just D&D-ish) neglect of the "macro" may have provided the context in which King Arthur Pendragon stood out to me (and apparently others) so sharply. There's a subtle and powerful synergy in that game among the levels of focus ranging from the personal to the familial and on up to the ecumenical. Pretty essential, I think, is that there's no short cut to getting the full effect; you've got to play through the whole arc from Dark Age to shining Camelot and back again, investing of yourself each step of the way. I guess the same might apply to appreciating fully the gravitas of LOTR; the fullness of the "long defeat," the hardness of hitting ground after a fall in the so-called happy ending, gets its complete context from the larger history of Middle-Earth. Given that no provision is given towards the future in terms of macro trends (that I can detect) the answer is a categoric no. I think we're just going to have to agree to disagree. I see no evidence that D&D has ever, in any TSR/WotC publication, been used as a vehicle for elegy. More to the point, it's strongest literary influences aren't elegaic and, in many cases, counter-elegaic. That's not to say one couldn't conceivably use the game in an elegaic fashion, but that strikes me as running against the grain of 30 years of history and tradition. I think we're just going to have to agree to disagree. I see no evidence that D&D has ever, in any TSR/WotC publication, been used as a vehicle for elegy. I think you may misunderstand me on this issue. It is not that elegy has ever been supported as a mode of play (and I am not saying that it definitely has not either, as there are some things that bear further examination on that score), but that it does nothing to discourage it. To then draw a distinction between Tolkien and D&D on the basis of elegaic structure seems... pointless to me, since the game does not comment either way. More to the point, it's strongest literary influences aren't elegaic and, in many cases, counter-elegaic. I don't think this is really a sustainable viewpoint. Whilst D&D was not initially influenced overmuch by Tolkien and Middle Earth, after the departure of the old guard pseudo Tolkienesque worlds were surely dominant. Whether they were elegaic is another question, of course. It seems we will have to disagree as to this, as I do not see any counter elgaic trends in the thirty years of D&D's history, only a banal indifference to the whole question of ultimate ends. To put it simply, I do not see it as going against the grain of the history of D&D, because I see no evidence that there is any grain to be gone against on this issue. That said, I also think this is a potentially very interesting question to explore; the premise is all over the place at the moment, and needs to be narrowed down, but I shall add this to my list of things worth further thought (along with "D&D and Frontierism"). Late but I think I realized something relevant. You point out that too many Tolkien fans miss the point that the book is elegaic and instead substitute triumph over evil. I was re-reading T1 The Village of Homlet last night and realized Gygax may have gotten that part of Tolkien better than many of his fans. The destruction of the temple did not end the evil and even if the characters do it has sources that are eternal. While Greyhawk is not an ending world where a good struggle to hold on to the light it is a world where the fight against evil is perpetual and victories, even great victories, are temporary. In that way his early vision of D&D created an environment much more hospitable to what the Silver Age would claim: the on-going epic struggle against evil. It's a different form that Tolkien but at least understand the idea of struggle. And this was in something not Gygax's primary emphasis. Now, if people could just get it through their heads that ages aren't random arisings of evils but the forgetting of the need for the battle in the first place.